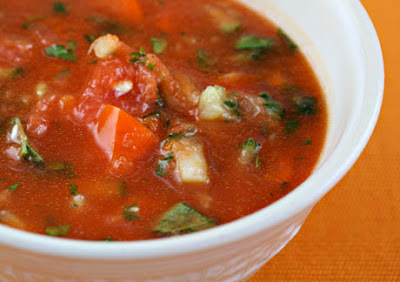 This no-cook soup, which first appeared on Soup Chick, has surprised and delighted many at Eating Well magazine. Use your food processor to chop the bell pepper, herbs, and shallot if you don't want to dice by hand. Exact proportions aren't terribly important here. Serves 6 generously; can be made 1-2 days ahead. Place all ingredients in a very large bowl. With a spoon, crush some of the watermelon to release the liquid; it will help get the blending started. Puree with an immersion blender, or in a stand blender or food processor in batches if necessary, to the desired smoothness (I like mine a bit chunky). Taste, and adjust seasoning with salt, Tabasco and black pepper.